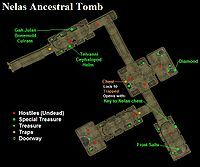 Nelas Ancestral Tomb is a large island tomb in the northern Sheogorad Region. There are nine undead enemies here. 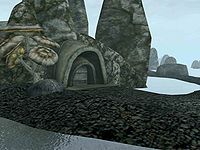 The loot consists of a potion, minor equipment (including a Telvanni Cephalopod Helm), quite a few ingredients, and a key to a locked chest. In the first room off the main corridor are two ashpits surrounded by skulls on spikes. The easternmost skull has a diamond in one of its eye sockets. There is a chest and a crate that each could possibly contain a random skill book. This page was last modified on 28 December 2016, at 03:57.